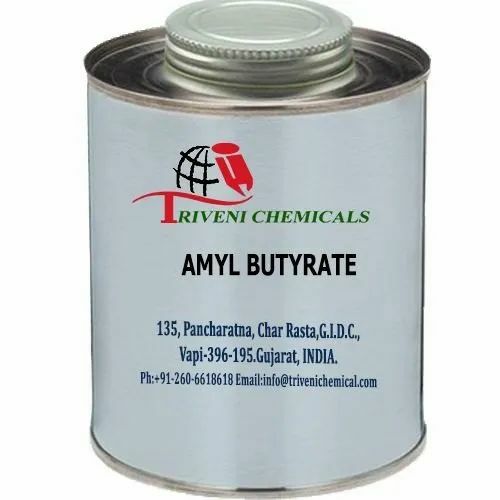 Amyl Butyrate 540-18-1 is liquid. it is also known as Pentyl Butyrate and Butyric Acid Amyl Ester. it is use in perfumery, food flavours, Aromatic, cosmetic, Soap Detergent and Fraganance Industry. Storage: Keep container tightly closed. Keep container in a cool, well-ventilated area. Incorporated in the year 2003, we, “Triveni Chemicals”, are a renowned organization, which is engaged in manufacturing and supplying a wide range of excellent quality Aromatic & Perfumery and Allied Industrial Chemicals. Under this range, we offer Glucuronides, Glutarimides, Glycol Ether Solvents, Glycol Ethers, Glycosides and Guanidines. In addition to this, we are offering Glycosaminoglycans, Halides, Halogen natural products, Halogen alkaloids, Hemiterpenes, Halomethanes and Halogenated solvents, among others. The offered range of the chemicals is processed by our chemical experts using excellent quality ingredients that are procured from the certified & reputed vendors of the market. Offered range of chemicals are highly acknowledged among the clients for their remarkable quality attributes such as longer shelf life, purity, effectiveness, precise pH value and accurate composition. Our team of expert professionals enables us to manufacture and offer a qualitative range of chemicals to the clients. These professionals hold the vast knowledge and experience of this domain that helps us in accomplishing the pre-defined goals of organization. Further, our expert professionals maintain a hygienic atmosphere in the premises to ensure the purity of the offered chemicals. Owing to the hard work and dedication of our competent professionals, we have garnered a huge clientele all across the nation.